This title is a common teaching of yoga teachers. Form before depth. They will tell you that everyday is a new day. Your body cannot do what it did yesterday nor has it done what you’re asking it to do today. Everyday is new. Skin to bones. Focus on form before depth. They say. Does your form dictate the quality of your depth of stretching? They ask. If you are flexible, then you must work on the form. They say. If you are strong, you must work on flexibility. They say. It’s only yoga. They say. If you can, you must. They teach. I’ve spent the last week doing yoga almost daily. Now that I’m back to my home studio. Luxury. Joy. It’s mostly all the same people. The teachers are still the best that I’ve met. My focus is renewed now that I sacrificed 367 days in another city. Practicing there was sporadic. Haphazard. Being back reminds me of the routine practice I left. And then missed terribly. 2017 will be a better year for this fitness. I’ve promised myself. I plan to reflect on all of that and more when I disconnect from the digital world for the next five days. This post marks my last words on interwebs. This 2016. Tomorrow I’m driving west of Stevens Pass to Scottish High Camp. In the heart of the North Cascades in Washington state. Where the snow has been falling for days. Storms galore! In the morning, I will catch a ride partway up a mountain. 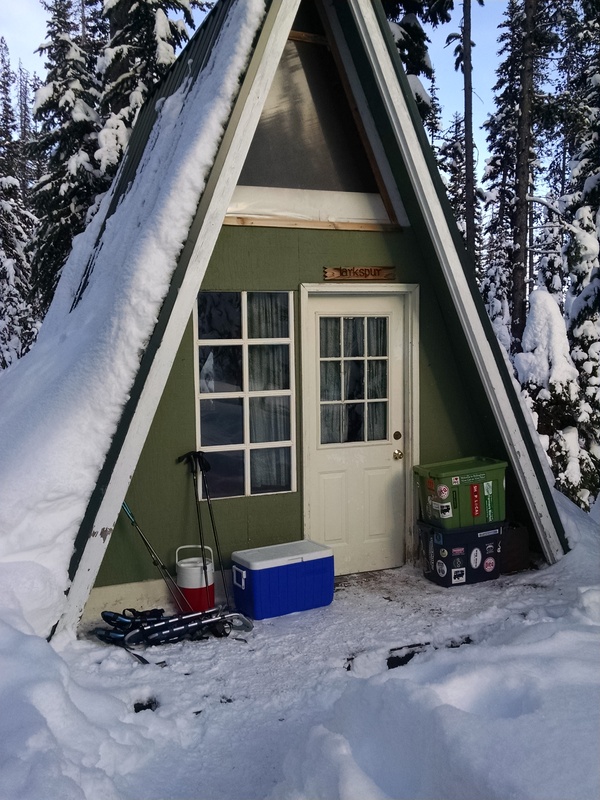 Then I will don my new (to me) snowshoes to walk the other four miles to my rented A frame cabin. In the North Cascades. The Swiss Alps of the Pacific Northwest. For the new year. And what a joy to not have to carry all of your stuff into the backcountry! What a luxury to stand there and watch your version of deluxe camping go up the mountainous road with snow too deep for vehicles. For miles. For a small fee, good mountain folks load all of your stuff onto a snow-machine and you watch it travel up the switchbacks. Beer chilling. Wood fired hot tub boiling. The quiet of snow falling. You just walk in the short days of winter. This will be joy. An avalanche shovel for the tree wells. I remembered this year! No Internet. This year. Just quiet. I plan to pry apart this past year in my mind. Stretch. Breathe. And then I’ll take stock of possibilities. [A Memoir]. This special place of rustic luxury is just what I need. Horizon remains the same for days. People scarce. Time with no deadlines. You can see hills and the trails that follow them for miles in this valley. Miles. You can see hills, sky, and trees. Blue marks on trees to follow. Trails that lead back to a cabin with food, spirits, and books. There are a great many paths to see the form of possibilities in the depth of snow. This entry was posted in Uncategorized and tagged A Memoir, Hiking, Travel Thoughts, Yogi Thoughts. Bookmark the permalink.